When you’re buying a new home, you’re able to take advantage of all the latest features in home design. Modern homes cater to the needs of modern families, so think about the things you want now and for the future. You never know if you'll want to upgrade again, so it’s wise to make choices that are universally appealing and avoid trends that might seem dated in future years. Below are some of the features we often see people looking for. Bigger isn’t always better when it comes to housing. A large home will cost more to heat, and your property taxes are partially based on the square footage of your home. Instead of going for the most square footage you can get when purchasing a new home, spend some time thinking about how you’ll use that space. It’s no use having a few bonus rooms if you can’t think of a reason to use them. Ideally, you want a home that has everything you need to feel comfortable in. You might be surprised by how big a well-designed floor plan can feel. Additionally, look for floor plans that fit your family’s needs. With young children, you might prefer bedrooms close together, but this isn’t as important when children are older. If you occasionally work from home, you might need a flex room that’s far away from the hustle and bustle of the rest of the home. These little things will make a big difference in your enjoyment of the home. Though you'll have to deal with snow in the winter, it's nice to be able to take advantage of the good weather when you do have it. This is easy when you’ve chosen a home design that incorporates outdoor living areas. At the very least, consider adding a patio or deck to your home. Many people enjoy additional features like swimming pools, large barbecue cooking areas, and outdoor fireplaces as well. If you’re hoping to host frequent gatherings, you’ll want a larger outdoor space. Whether it’s about cooking and eating, family game night, or just doing homework, you’ll want a kitchen designed for your active family. Naturally, this room is one of the most important rooms to get right. Think about some of the features that might be important for your family and find ways to incorporate those into the kitchen design. For instance, you might want an open space to watch kids playing while you do the cooking, extra cooking space for hosting holiday gatherings, or a large pantry to store all the food you’ll need to make it through the teenage years. Everybody needs their own space sometimes, especially in a large family. You might relish the peace and quiet from time to time. Why not look for this in your new home as a built-in feature? Many home models have a Master Suite that's situated away from the other bedrooms so you won't hear much noise from them, and you could even look for a new home that has an ensuite bathroom so you won't have to wait for the main one to clear out when you're getting ready. Families are also looking for ways they can save on energy costs while doing good things for the environment. A lot of new home builders incorporate things like triple pane windows and energy saving appliances into the design of the home, but it’s always smart to see if you could take things a step further. Ask your builder about their standard energy-saving features, as well as anything else you can add to make your home more efficient. One of the biggest disadvantages of older homes? The lack of storage to meet the needs of today’s families! However, there are plenty of ways to maximize your storage space in a new home build. 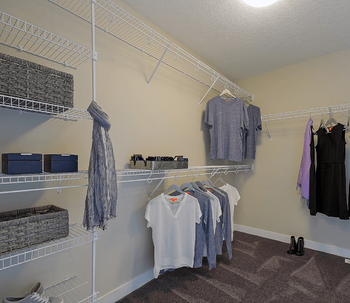 Are the closets big enough to hold all of your clothes? Is there ample cupboard space in the kitchen or will you need a separate pantry? If you’re finishing the attic or basement, is there still room for you to store bulky items like holiday decorations or luggage? Adequate storage space reduces clutter so that your home can look its best at all times. Newly-built homes can certainly accommodate all of the latest technological advances. While self-cleaning homes that also prepare family meals are still a long way away, you should be able to add features like a “charging station” for your family’s electronics, programmable thermostats to control the temperature and a sound system that plays music throughout the home. Ask your builder about any smart home features you should include in your home. One major advantage of a new build home is the security you have knowing that you won’t be dealing with major repairs in the near future. Most appliances in a new home will have a manufacturer’s warranty, but the details of the home warranty can vary from builder to builder. How long does it last? What types of annual maintenance is required to keep the home warranty in good standing? Ask questions if there’s something you don’t understand. This isn't technically a feature of the home itself, but we think it's every bit as important. Finding the right community to live in will affect the day-to-day enjoyment of your home just as much as the home itself. 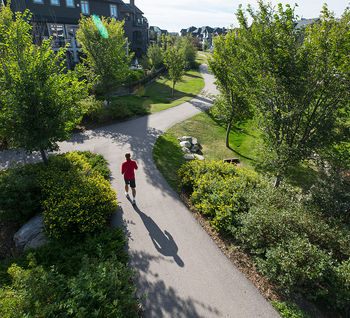 Do you like the outdoors and need lots of green spaces or walking trails? 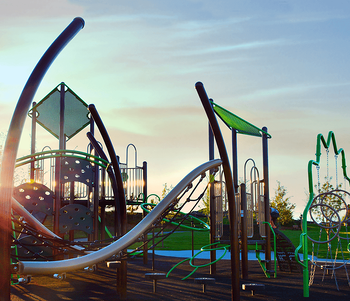 If you have young children, is there a playground nearby? How's the commute? Is it quick and easy to get to work every day? Which schools are nearby? Is the community in the right district for the school you want? How are the nearby amenities? Will you need to travel a long way to get groceries? It's important to also consider your future needs when finding the right location - for example, if you're planning to switch jobs in the next year or two then finding a location that's an easy commute for your current job might not be as important as it would otherwise be. You'll probably be in your new home for at least a few years, so try and consider what your needs could be in five years or more. These are just some of the things that are popular with people who are searching for a new home. Of course, every family has different needs. The best thing about buying a new home is that you’ll be able to have your needs taken care of no matter what they are. Originally posted Sept 15, 2016, updated Apr 2, 2019.